So the rumor that caught fire last week was that two time Academy Award winner Christoph Waltz has signed on for a mysterious role in Bond 24. So naturally, people think that his role is that of the film's latest villain. After all, this is the man who won his first Oscar playing famed "Jew Hunter" Col. Hans Landa. Django Unchained or not, Waltz made his first great impression as an antagonist, and a brilliant one at that. This just makes us think that if Waltz is going to be a baddie in the Bond franchise, he's probably going to be the greatest baddie of all: Ernst Stavro Blofeld. 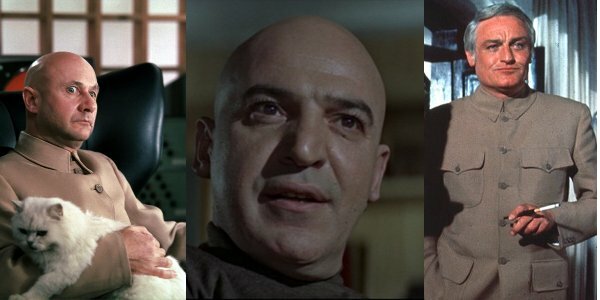 A little background for the uninitiated, Ernst Stavro Blofeld ran the criminal organization SPECTRE, a shorthand acronym for "Special Executive for Counter-intelligence, Terrorism, Revenge and Extortion." Blofeld's organization was behind the evil plots showcased in Dr. No all the way through to Diamonds Are Forever. In the course of those seven films, James Bond was foiling Blofeld's underlings left and right, until he finally took the fight to Blofeld himself in On Her Majesty's Secret Service. Just when we thought the fight was over, Blofeld put a hit out on Bond's newly wedded wife and terrorized him for two more outings. Blofeld's name was never overtly mentioned in his final appearance in For Your Eyes Only, the reason being that the character was successfully made the property of writer Kevin McClory after a legal dispute. However, last fall the Bond franchise acquired the rights from McClory's estate, allowing them to once again have Blofeld and SPECTRE on hand for their filmmaking purposes. This brings us to today, as the James Bond franchise has passed its 50th anniversary, and is in full reboot swing. This is the perfect time to cast an actor with as much gravitas and gleeful anarchy as Christoph Waltz has to play the part of the biggest baddie in the history of the James Bond series. If there's any move that the producers could use to drum up tons upon tons of continued interest in the franchise, especially considering it's flying high and only has Daniel Craig for two more films, then that move would be to resurrect SPECTRE as 007’s greatest enemy. Bringing SPECTRE and Blofeld back into the fold would not only draw older Bond fans, it would also offer a nice through line into the next actor that takes up the Walther PPK. Imagine it: Bond is presumed dead on Craig's last op against Blofeld and his crew, only to come back in Bond 26, fresh faced and ready for action. While the Bond we see on the screen would be new, the villains would still be in play from before, thus lending an air of familiarity. With any luck, Ralph Fiennes, Ben Whishaw, and Naomie Harris will also renew their contracts, thus leaving 007as the only new face to adapt to in the future sequel. Though James Bond fans have been burned before, especially considering how many times Kevin Spacey was hinted at for a villainous role in recent Bond history, only for it not to happen, it would be nice to have Christoph Waltz confirmed as the next man to strike fear in our hearts the way that Donald Pleasence, Telly Savalas and Charles Grey before him could. Should Waltz be cast, but not end up playing Blofeld this time around, that's perfectly fine. Still, it’s what we’re hoping for.